This week sees the NFL's International Series continue with another game at Wembley, London & there has even been talk of having multiple games each year with a view to seeing whether there is potential for a franchise to be based in the UK. It's exciting times for British football fans & the two teams travelling across this year have genuine playoff aspirations with the improved Tampa Bay Buccaneers taking on the Chicago Bears from the hottest division in the NFL, the NFC North. We're taking a look at that game & finding the best bets from the rest of this week's games & trying to follow up on our red hot touchdown scorer betting form that has turned a profit of £339.92 to a £10 stake from 16 bets this season. There has been a pattern of success when it comes to winning in the London game with teams coming across to the UK to prepare winning whilst teams flying over last minute as if it's a normal away game tend to pay the price for lack of preparation in the different surroundings, this doesn't bode well for the Chicago Bears who've taken the second option whilst this is the Tampa Bay Buccaneers 2nd time at Wembley after 2009 & they've been in the UK since Monday this time around. Neither side have been offensive powerhouses with the Buccaneers ranking 14th in passing yards & 15th in rushing, the Bears rank 21st & 20th in the same categories. On the defensive side both have been somewhat poor against the pass with the Bears ranked 25th & the Bucs 26th & the Bears have been giving up more yards on the ground than the Buccaneers. The key players in this game on the offensive side look to be ace running back Matt Forte for the Bears & hugely talented quarterback Josh Freeman for the Buccaneers. Forte is an offensive powerhouse who leads the team in rushing with 527 yards & in receiving with 36 catches for 381 yards, it is somewhat surprising to see him with just two touchdowns on the season though, although it is sensible for the Bears to use the bruising Marion Barber in short yardage rushing situations. 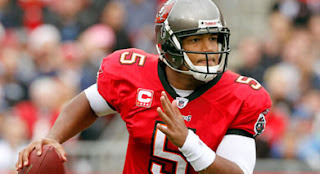 Tampa Bay's Josh Freeman is a massive talent in more ways than one, standing at 6 foot 6 inches tall allows him to see over the offensive line & pick out passes with accuracy (62.6% this season), he's also quick with his feet & hard to stop if he gets rolling, with two rushing touchdowns already this season you would think the bookmakers would take note but they haven't he's available at 33/1 to score 1st & a huge 5/1 to score at anytime. With running back LeGarrette Blount looking slightly doubtful fitness wise the Buccaneers will elect to put the ball in Freeman's hands & he can find his set of receivers with regularity, including second season players Arrelious Benn & Preston Parker, to put the Bears under real pressure. There is strife in the Bears camp with Forte wanting a new contract, safety Chris Harris requesting a trade & maligned quarterback Jay Cutler seen to be arguing with his offensive co-ordinator during the victory against the Vikings, we like the Bears a lot - they have the tools to perform well (especially the irrepressible Devin Hester!) but things are conspiring against them. Add to the Bears troubles that their offensive line isn't performing well enough to keep Cutler out of trouble & they may struggle this week, we're picking the Buccaneers to win this one at odds of 23/20. Elsewhere the Houston Texans travel to the Tennessee Titans in crucial AFC South game, with one of these two sides looking most likely to win the division & progress to the playoffs. The Titans are coming off a bye week whilst the Texans come off a loss away to the powerful Baltimore Ravens, the Texans run in for the rest of the season appears to contain eminently winnable games & they will want to start rolling here. The Titans surprised everyone in week 2 with their win against Baltimore & they've since gained wins against poor Broncos & Browns teams before taking a beating against the Pittsburgh Steelers in week 5. Quarterback Matt Hasselbeck has performed to a higher level than many people expected this year & it helped that he started out with top notch wide receivers Nate Washington & Kenny Britt this year, Britt unfortunately tore ligaments in the Broncos game & is out for the season, he'll be a big loss & Hasselbeck's passing numbers have dropped in the games since. With their pass offense weakened the Titans may opt to switch more to the ground game & they have the player in 2009's offensive palyer of the year, running back Chris Johnson, the thing is that this year it just hasn't been happening on the ground for Chris & the Titans, they rank last & Johnson has only had 100+ yard rushing game, he seems to be used more out of the backfield than as a traditional rusher. This looks a great game for the Texans to be playing with Tennessee having fundamental problems in offense as they lost star linebacker Mario Williams 2 games ago & it showed against Baltimore, on the other side of the ball they seem to be clicking in all areas of the game. Although the Titans defense is a solid unit & they rank pretty well against both the pass & run they will struggle against the options that the Texans have, Matt Schaub is a very good QB, Arian Foster was last season's leading rusher & although star receiver Andre Johnson is sidelined they are able to go to top tight end Owen Daniels instead. In terms of rushing the ball the Texans have used second season player Ben Tate as much as Foster & he has been excellent with 4.7 yards per carry, with so many options the Texans can wear down all areas of a defence & keep getting 1st downs, they can win this without the points they'd get on the spread & at odds of 6/4 they rate a serious bet.